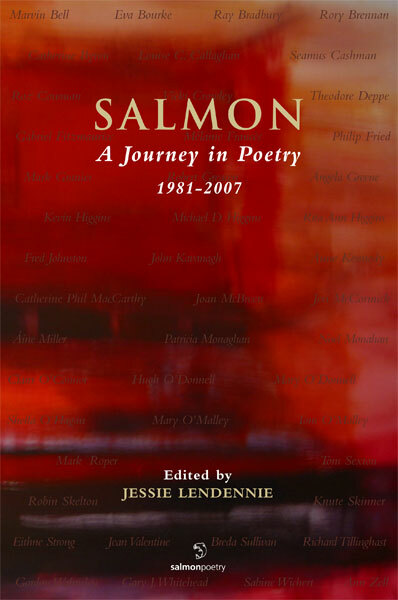 Salmon: A Journey in Poetry 1981-2007 celebrates 26 years of innovative and exciting Irish and international poetry. The organization of the volume is simple: two poems from the poet's Salmon collection (or collections) and one uncollected poem. Detailed biographical notes for each poet, and a complete bilbiography of Salmon's publications, are also included. The poets featured are: Nadya Aisenberg, Nuala Archer, Leland Bardwell, Marck L. Beggs, Michael S. Begnal, Marvin Bell, Eva Bourke, Ray Bradbury, Rory Brennan, Heather Brett, Patricia Burke Brogan, Simmons B. Buntin, Sam Burnside, Catherine Byron, Louise C. Callaghan, Seamus Cashman, David Cavanagh, Jerah Chadwick, Patrick Chapman, Mary Coll, Roz Cowman, Vicki Crowley, Theodore Deppe, Mary Dorcey, Carol Ann Duffy, Michael Egan, MÃ­cheál Fanning, Gabriel Fitzmaurice, Mélanie Frances, Philip Fried, Erling Friis-Baastad, Paul Genega, Frank Golden, Michael Gorman, Mark Granier, Robert Greacen, Angela Greene, Maurice Harmon, Clarinda Harriss, Anne Le Marquand Hartigan, Michael Heffernan, Kevin Higgins, Michael D. Higgins, Rita Ann Higgins, John Hildebidle, Ron Houchin, Ben Howard, Gerald Hull, Fred Johnston, John Kavanagh, Anne Kennedy, Thomas Krampf, Jessie Lendennie, James Liddy, Dave Lordan, Catherine Phil MacCarthy, Joan McBreen, Jeri McCormick, Stephanie McKenzie, Ethna McKiernan, Ted McNulty, Máighréad Medbh, John Menaghan, Ã�ine Miller, Patricia Monaghan, Noel Monahan, Alan Jude Moore, Tom Morgan, Jude Nutter, Jean O'Brien, Clairr O'Connor, Hugh O'Donnell, Mary O'Donnell, Ciaran O'Driscoll, Mary O'Donoghue, Desmond O'Grady, Sheila O'Hagan, Tom O'Malley, Barbara Parkinson, Mary O'Malley, Gwyn Parry, Angela Patten, Paul Perry, Mark Roper, Tom Sexton, James Simmons, Janet Shepperson, Janice Fitzpatrick Simmons, Robin Skelton, Knute Skinner, Jo Slade, R.T. Smith, Olaf Tyaransen, Eithne Strong, Jean Valentine, Breda Sullivan, Richard Tillinghast, John Unrau, Peter van de Kamp, Michéle Vassal, Eamonn Wall, Emily Wall, Gordon Walmsley, Gary J. Whitehead, Sabine Wichert, and Ann Zell. Salmon: A Journey in Poetry is a very substantial anthology of verse by 106 poets from the Salmon stable. It is an impressive testament to the work of this publishing house, which was set up in 1981 by the book's editor, Jessie Lendennie, who has served the cause of poetry in Ireland admirably for 27 years now. She was born in Arkansas in the United States but has lived in Ireland since 1981, firstly in Galway and, since the mid-90s, in County Clare, near the Cliffs of Moher. For the first few years of its operation, Salmon concentrated largely on publishing verse by women poets who had not yet published collections, but gradually its list widened to include male poets, some previously unpublished and others who had been published elsewhere but who switched to Salmon. Some, indeed, had well established reputations, such as Rory Brennan, Robert Greacen, Fred Johnston, James Liddy, Des O'Grady, James Simmons, Robin Skelton and Knute Skinner. Among the women poets whose careers were advanced by Salmon are such well known names as Nuala Archer, Leland Bardwell, Eva Bourke, Heather Brett, Louise C. Callaghan, Roz Cowman, Anne le Marquand Hartigan, Rita Ann Higgins, Jessie Lendennie herself, Catherine Phil MacCarthy, Máighréad Medbh, Mary O'Donnell, Sheila O'Hagan, Mary O'Malley, Jo Slade and Eithne Strong. Only a handful or so of these poets had already established strong reputations as writers before being published by Salmon. In more recent years the press has become more cosmopolitan, more international, with the addition of such writers as Nadya Aisenberg, Marvin Bell, Ray Bradbury, Theodore Deppe, Carol Ann Duffy, Mélanie Frances, Erling Friis-Baastad, Paul Genega, John Hildebidle, Ron Houchin, Ben Howard, Adrienne Rich, John Unrau, Jean Valentine, Michéle Vassal, Sabine Wichert and Ann Zell. Two poems were chosen from the volumes published by Salmon of each of the 106 poets, who were asked then to supply an unpublished third poem. There are so many good poems that could be highlighted, but here are a random few that made an immediate impression: Nuala Archer's 'The Lost Glove is Happy'; Leland Bardwell's 'Moments'; Rory Brennan's 'The Paper Kisses', and 'Equality is not Defeat'; Sam Burnside's 'The Salt Box'; Roz Cowman's 'Peanuts'; Vicki Crowley's 'The Sky Road'; Robert Greacen's 'At Brendan Behan's Desk'; Ron Houchin's 'Translating Water'; Ben Howard's 'Remembering Galway'; Mary O'Donnell's 'My Father Waving', and, particularly, 'Unlegendary Heroes'; Mary O'Malley's 'The Otter Woman'; Paul Perry's 'The improbable flowers of Vizcaya'; Robin Skelton's 'Two in a Garden'; and Richard Tillinghast's 'Snowflakes & A Jazz Waltz'. And there are many other memorable verses in this treasure-trove of poetry from Salmon. This is one anthology that is worth its weight. Essay: For more than 26 years, Jessie Lendennie has been nurturing and publishing poets via Salmon Poetry, from her home in Co Clare. One of them, Eva Bourke , salutes her contribution. If one compares Gallery, Dedalus and Salmon Poetry, three major poetry presses in Ireland, the former two could be likened to two weighty ships pursuing the course of the great poetic narrative with a worthy crew and an exclusive dignified passenger list, Salmon Poetry, on the other hand, to a lighter sailing vessel tacking against the wind and waves and rescuing refugees and wanderers from all ends of the earth. These will be nurtured, encouraged and safely put ashore again to make room for newcomers. Jessie Lendennie, who has been running the press for more than 26 years, possesses the rare gift of an inclusive and non-judgmental disposition. The quality of the work and the bibliography of poets in Salmon's recently published anthology, Salmon: A Journey in Poetry 1981-2007, edited by Lendennie - its cover featuring an eye-catching detail of an abstract painting by Maunagh Kelly - attest to a non-parochial, cross-cultural ethos, openness towards diversity and an animating spirit of discovery and risk-taking that have benefited many, and in the long run also the press itself. Recently Jessie Lendennie and Siobhán Hutson, who is in charge of the production and design of Salmon's famously attractive books, went to New York together to take part in the conference of Associated Writers and Writing Programmes. They also introduced the anthology - in which myself and many others are included - with a reading in the Bowery Poetry Club. In her characteristically brief and engaging introduction to the anthology, Lendennie writes that as a melancholy, poetry-addicted adolescent she would never have imagined she would eventually "lead a life filled with space, books, writers and poetry", but that's exactly what happened after she arrived in Galway in the mid-1980s from the US via London. Her and her partner, Michael Allen's plan had been to dedicate themselves to writing but, having come from a lengthy stint as assistant at the Poetry Library in London, she missed the exchange of ideas with other writers, joined a workshop in the university in Galway, and discovered that there were hardly any outlets for publishing poetry in the west and that many talented women writers mainly wrote for their desk drawers. IN TYPICAL HANDS-ON fashion she started a broadsheet, which metamorphosed into the Salmon poetry magazine and not much later the Salmon Poetry press or Salmon Publishing, as it was then called. Today Salmon Poetry operates from a small, green, two-storey house near the Cliffs of Moher. When I visited Jessie there recently I was greeted on arrival by five friendly sheepdogs who accompanied us into the airy book- and paper-littered office where she and Siobhán work. Both a tribute to the poets as well as a testimony to the remarkable energy and dedication Lendennie has shown in keeping Salmon afloat through occasionally very turbulent times, the anthology is a voluminous book dedicated to the memory of the eight Salmon poets who have meanwhile died, Anne Kennedy, Eithne Strong and Ted McNulty among them. On roughly 400 pages it features three poems each by 106 poets who were published by Salmon during the past 26 years, sufficient evidence that the press has finally entered a calmer period and may be allowed to rest a little on its laurels. Whether one dips into it now and again or reads large sections in a single sitting one will come across beautifully animated poetry by literary greats as well as poets whose names are less familiar, from both sides of the Atlantic. As a record of poetry-publishing history and the progress of the art throughout the latter years of the 20th century the book is invaluable and ought to be on the Irish literature shelves of all libraries in the country. Poetry publishing is an arm of the book industry that is in permanent crisis, especially because many bookstores refuse to stock poetry or banish it to the dark remote corners of the shop. Large publishers safely opt for the re-publication of collections by established poets or for anthologies of recycled canonical poems with a smattering of more recent ones all packaged nicely under headings such as "Poems for Winter" or "The Angel Next to You", as I saw in Berlin bookstores recently. Intended for customers who can't think of any other birthday or Christmas present, they have a middling chance of selling. New poetry, always a minority interest, is a tender blossom in need of shelter from the harsh climate of market forces, especially if it is innovative and experimental. Anyone mad enough to launch a poetry press into this world, in particular one that is specialising in work by unknown poets, is therefore at risk from the start. In this country and in Britain the Arts Councils hold a protecting hand over these enterprises. But only after a lengthy period during which they must truck on until they have proven themselves worthy will poetry publishers be rewarded with a grant that will just about keep the wolf from the door. LENDENNIE HAS BEEN there, as she will freely tell you. She has fought for Salmon and has managed, with the invaluable assistance of Siobhán Hutson, to keep it going on a shoestring year after difficult year. Their labour is Herculean. One of Jessie Lendennie's most attractive and disarming traits is her maternal manner towards her poets. Like a good parent, she is a facilitator, not a dictator. She has no interest in forming anything or anyone after her own image but gets on with the task of getting the books out. I remember well how invariably obliging she was despite her chronic money shortage, how she always did her utmost to keep her poets contented - a difficult enough undertaking - and how unhappy she was if she failed. Over the years she particularly encouraged women, who in the beginnings of the press were so disheartened by Ireland's male-dominated literary establishment that they had stopped sending work out. Rita Ann Higgins said recently that we were very lucky to have her at the time of starting out as poets, and so we were. Our lives and those of many other poets might have turned out quite differently had Salmon Poetry never happened. Salmon: A Journey in Poetry, 1981-2007, edited by Jessie Lendennie. When the thick copy of Salmon: A Journey in Poetry, 1981-2007 arrived at my suburban Philadelphia home, posted from County Clare, I was more than a little enchanted by its return address and the path it had taken to arrive at my door. The package had been sent to me by Jessie Lendennie, co-founder, managing director, and commissioning publisher of Salmon Publishing. No one had ever before sent me anything from Ireland, and surely not from rural terrain just north of the Cliffs of Moher. Known to me only from her fresh-scrubbed web photos, where she can be seen hugging border collies and sheep, Lendennie is an editorial board member of Terrain.org, a woman of my own generation, born in Arkansas, transplanted into the northeast corner of another country-one that she journeyed to 26 years ago, loved, and did not leave. She is a poet, teacher, editor, and publisher. Lendennie's ever-widening journey in poetry was captured in a 2001 Terrain.org interview with Simmons Buntin. From starting The Salmon International Literary Journal in 1982 to publishing more than 200 volumes of poetry through Salmon since 1986, her trip has become increasingly inclusive: first, providing a venue for Ireland's under-published women poets; then adopting the work of other English language poets until Salmon became the international publishing house that it is today. My own venture through almost 500 pages of Salmon poets was in many ways made as a foreigner, an awestruck linguistic outsider. Lendennie has assembled a democratic anthology of three poems from each of 106 poets she's published-well-known and lesser known-and provided us with bios, then sent us on our way to identify with the familiar or sample new voices from beyond the breakwaters. At first, I grabbed onto familiar landmarks: James Liddy and Nuala Archer, known from the time I spent as an undergrad and graduate student at the University of Wisconsin-Milwaukee. And Simmons Buntin, R.T. Smith, and other poets who reference familiar places: Americans and ex-pats writing about being in Kentucky, Nebraska, Florida, New Jersey, Boston, New York, even Northfield, Massachusetts. But this anthology is so much a product of place, there is no way to read its poems without becoming a traveler. I crossed over, immersed myself in its transatlantic landscapes: places filled with wind and light, the rough Atlantic coast, cold sea, moonlit hills, its painterly, elegiac world of longing. The poems she gathered together map out a lyrical odyssey of place names: Shellybanks, Calf Bay at Lumb Bank, Lughnasa, Kinvara, Connemara, Knockanure, Renvyle, Achill Island. Our poet guides on this journey seduce us with delicious diction-fresh, Hiberno-English, sculpting a world that includes the Nemeton, furze and briony, clasai snow and windolene, where people chunter and recite the angelus. Music replaces context, and we nod along-not fully understanding, but willing to be taken there-to listen to talk of Mullenfad, Erannach, and Eidolan. On your memory card's faint photo. One deep arroyo the spine-thin particles are falling away from. To bring the sea, over your other shoulder, into quadrille coastal time. Level strands are stretching far away. On the journey, quietly pressed your words on the paved streets. You heard each measure crafted on this, our slow, brief watch. You took to town was your way forward. And the way itself. At the end of the reader's brief visits with more than 100 contemporary Irish, British, American, and Canadian poets, there are places I want to revisit, other Salmon volumes I want to read. I want to linger longer with the poems of David Cavanagh, Theodore Deppe, Melanie Frances and Michael Heffernan. I want to hear Rory Brennan tell me about a placewhere On past / The smart new housing for the unemployed the diesels / Churn and hiss, trailing a dragon tang out to / The crane-forested docks and the ferry's leviathan jaw. Want Heffernan to keep on describing a gray abyss the lacy disks / of the wild carrot where my peppers were / stir into spots of incandescent white / between the river meadow and my eyes. Hope to again hear the voice of Richard Tillinghast, much as it begins "A Quiet Pint in Kinvara": Salt-stung, rain-cleared air, deepened as always / By a smudge of turf smoke. Overhead the white glide / Of seagulls, and in the convent beeches above the road, / Hoarse croak of rooks, throaty chatter of jackdaws. In this anthology, Jessie Lendennie brings us 318 poems she has gathered along her path from Arkansas to County Clare-and at journey's end, we want more. Anthologies can be merely irritating: they often print too few poems by too many writers with too little information or context, all presented on paper that's too thin. The result can be a blurred, curiously flat, and ultimately confusing reading experience. Pity that often enough this is the first experience students may have with poetry. And except for its paper (a standard and serviceable stock) Salmon: A Journey in Poetry would seem guilty of all these sins. It runs to over 450 pages. It presents, in alphabetical order, work from over one hundred poets, from Nadya Aisenberg to Ann Zell--in each case, exactly three poems. Each of these writers has published at least one book with the Irish publisher Salmon Poetry Ltd. As a book on its own, Salmon: A Journey in Poetry measures over an inch thick. It is beautifully designed. And it has no right to work as a reading experience. Yet it does. Salmon: A Journey in Poetry works in its entirety and in many of its parts. It does so based on the depth and breadth of one person's editorial intelligence and sensibility honed over the course of twenty-six years. The editor is Jessie Lendennie, and her list, Salmon's list, embraces writers from Sligo to Los Angeles, from Dublin to Newfoundland, from Galway to Limerick to Portmarnock to Belfast to Detroit. Yes, Detroit, for Salmon's list is eclectic and global. Yet the poems, drawn from so many writers and so many disparate locales, remain related to each other. They are cousins, though perhaps distant ones sometimes. They build on fundamental experiences of location, weather, family, "...the sound of birds / and the hum of years" (in Lendennie's own poem, The Search). Sometimes these elements offer consolation, but just as often they form the setting for an unfolding and deepening fear--a child gone missing (in Angela Greene's Silence in the Blue Night)--or for elegy (in Sheila O'Hagan's The Wood Pigeon). even a tenor at Carnegie Hall ("and now I see his eyes full / as if suddenly he was millionaire / who had come from the land / where the road to Ballyduff / was made of marble / and a Count sang in the square" -- Ted McNulty). When one reads a novel or short story or memoir, the aim is clear enough: to find out what happens, yes, but also to hold the setting, language, characters and their arc of action entire in one's mind. And one can work towards a similar reading of a book of poems (Elizabeth Bishop's Geography III for example) -- one pleasure and goal being to hold the speakers and subjects of those poems in conversation with each other. Salmon: A Journey in Poetry is simply too large to attempt this for the book entire. But as an anthology, it allows as many smaller conversations as one wishes to discover. Or think of it this way: a book of poems is an art show by a single painter (who may also be exhibiting prints and water colors). An anthology like Salmon: A Journey in Poetry is an art museum entire. You wander, lose track of time, and get most pleasantly lost. Lex Runciman is the author of three collections of poems, including The Admirations (1989), which won the Oregon Book Award, and, most recently, Out of Town (2004). This past April he had the chance to participate in Spokane, Washington's literary festival GET LIT!. He's done several college writing textbooks with co-author Chris Anderson over the years, and he teaches at Linfield College, in the Willamette Valley of Oregon. SALMON POETRY (1981 - 2007). Presenter Gerald Dawe presents a programme celebrating and assessing the impact of Salmon Poetry, one of the most innovative and exciting publishers of Irish and international poetry. The book under discussion in Saturday night's programme is the new anthology reflecting the wide scope and variety of Salmon Poetry over 26 years : "Salmon : A Journey in Poetry, !981 - 2007." The anthology, which will be discussed by Salmon poets, Maurice Harmon, Anne Hartigan and Rory Brennan, selects some of the finest poems from the 200 volumes that have been published by Jessie Lendennie, one of the most imaginative, hard-working and dedicated of Irish publishers. Guest poets on The Poetry Programme, Maurice Harmon, Ann Hartigan and Rory Brennan will be reading from their own poetry as well as discussing the significance of this landmark Salmon Poetry volume which publishes poets, both Irish and international, ranging from Carol Ann Duffy and James Simmons to Ray Bradbury and Mary O'Donnell. Review by DREW BLANCHARD, of the University of Wisconsin-Milwaukee for An Sionnach: A Journal of Literature, Culture, and the Arts (Creighton University Press). Spring 2009. Contemporary poets do not expect to have money thrown at them. Mardi Gras-style parades are not held in poetry's honor. Beads and doubloons are not tossed to poetry as it rests atop a giant float, broadcasting, megaphone in hand, to a cheering crowd, sestinas and images of streets draped in moonlight. Poetry-as an art form, as an entity-has a rough go in the traditional US marketplace, and historically to a lesser degree in Ireland, though even this is changing. Aside from Ruth Lilly's $100 million dollar gift to Poetry magazine in 2003 (now, aptly named the Poetry Foundation), few large endowments are made to poetry journals and presses. It is not an understatement, then, to say that publishers like Salmon Poetry are modern day heroes for lovers of the craft. Salmon, founded in 1981 by Jessie Lendennie, is based in Co Clare, Ireland, near the Cliffs of Moher. Lendennie's voyage into the world of Irish poetry began with The Salmon Journal, a magazine of poetry and prose. Since those early days, she has published over 200 poetry titles and established Salmon as a central figure in Irish, and in more recent years, international poetry. A testament to the merit, to the breadth and depth of Lendennie's passion for poetry is collected in Salmon: A Journey in Poetry 1981-2007. Ar ranged in alphabetical order, each poet is represented by three poems, two from their Salmon collection and one uncollected poem. Also included is a detailed biography of each poet and a list of Salmon's complete bibliography (an impressive list for a small press). Salmon has continually taken risks; publishing unknown writers since its very first days with The Salmon Journal and with its first books by Eva Bourke and Rita Ann Higgins. Many of these 'unknowns' are now firmly established with their own contribution to Irish literature. The conventional approach is what makes art comfortable for people, accepted and necessary, but creative expression is not always so. These sentiments, without question, present a precarious mission statement for Salmon Poetry. Adhering to notions of "creative expression" and giving voice to talented "unknown" writers in the fiscally difficult world of poetry is more than risky. Where would poetry be, though, without the risk, without this uncertainty, without the requisite surprise that poets like Robert Frost speaks of in terms of writing? Frost's famous adage, "no surprise in the writer, no surprise in the reader" transfers well to publishing: "no surprise for the publisher, no surprise for the reader." Lendennie's gamble on poetry, something she clearly loves as evidenced in the poems collected the anthology, has paid off for both readers and writers of poems. Even though it contains the mark of one press, comprises the work of many Irish poets, to identify a unifying force or theme that ties such a large anthology together is difficult. The point, fortunately, of bringing these poems together is not to identify a form of unification. What the book does present, though, is a look into a contemporary record of Irish, Canadian, US, and European poetry. In so doing, the anthology looks both forwards and backwards in time. A recent Salmon collection by Michael S. Begnal, Ancestor Worship (2007), is an admirable book by a younger Salmon author; and the book's title poem, included in the anthology does this work: it looks back at multiple histories as it represents one future of poetry. how a whole country could empty its throat. I am not an ordinary woman. I wake in the morning. to steal my child, my lover. I am writing this from a hilltop in northwest County Clare on a cold late August morning just before dawn. In a little while I'll see daylight over Lahinch and Liscannor Bay down the valley, three miles away. If someone had told me when I was a melancholy, poetry-addicted adolescent that I would eventually grow up to have a life filled with space, books, writers and poetry, I could not have imagined it. Fortunately for readers, for poets, and for poetry, Lendennie did imagine this life. And while the Fat-Tuesday-Mardi-Gras-Parade that poetry deserves, may never come, Salmon: A Journey in Poetry 1981-2007 not only moves beyond any sense of the ordinary, it adumbrates, convincingly, a strong future for poetry, a strong future that depends on the energy of small presses like Salmon Poetry who "take risks, publishing unknown writers."